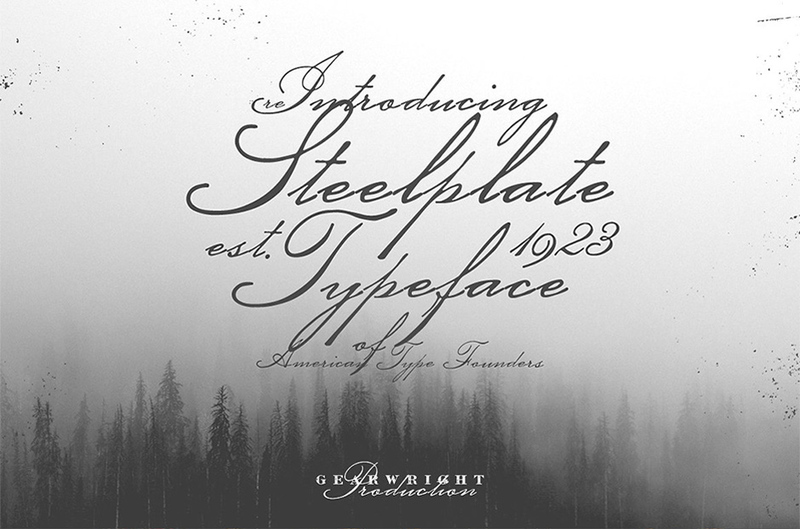 • Absolutely lovely typeface, Steelplate Script works very well for vintage theme projects. Imagine this on an invitation card. File size is approx 23KB (37KB unzipped), offered as a single download. We hope that you have great fun working with your new script font! Thanks so much for commenting Lisa! We’re so happy to hear that you find these brushes beautiful and hope that you get great use out of them :). Interesting vintage script. Thanks so much for this week’s freebie! Thanks for the comment on Steelplate :). We hope that it adds some interesting touches to your lovely work! Thank you for the beautiful script font! Thanks so much for lovely comment and we’re so happy to hear that you love it! Unember, this is absolutely gorgeous! Thank you so much. I’m a huge fan of vintage typefaces, but some, lovely as they are, I can tell that I’ll use them very occasionally. The thing I love most about your Steelplate Script is that its so incredibly USABLE! I can see this on a huge variety of projects, and its going straight in my ‘Go-To Typefaces’ file. Thanks Design Cuts, and Unember, thanks so much for your generosity, and I’m thrilled one of those 60K copies ended up in your hands,so you could immortalize this lovely script! Thank you so much for taking the time to write such a lovely comment! It’s awesome to hear that you find this font really versatile and that you are adding this one straight into your Go-To folder- we hope that you find Steelplate really useful for your upcoming projects :). If you would be happy sharing any of your designs with us Orachel, we would love to see what you create with your new font! You’re so welcome Susan, happy designing! We hope that you get lots of great use out of your font! What a lovely font! Thanks so much, Unember and Design Cuts. We’re so glad that you love it Sheila, happy designing! Love the elegant appearance of this product. Thank you so much! Thanks for commenting and we are so happy to hear that you love it! Thanks so much for leaving us a comment and we hope that you love working with your new script font! I hope that you find this font super useful for your creative projects! You’re so welcome Ulrike, we hope that you love working with it! Finally I found a font that is PERFECT for making faux PASSPORTS for my journals. I love it…thank you so much and to think I almost passed it by until I took a second look and it jump out to me. IT IS PERFECTO!!!! WOW the journey to find the right font is finally over!!! Yay its awesome to hear that this font is perfect for your particular projects Joey! We hope that you get lots of great use out of it, happy designing :). We hope that you have great fun working with your new font Greg! Thanks, Design Cuts — yer the best! Woohoo thanks Greg, we’re so happy that you love it! I just LURVE Unember and their beautiful resources! Thank you both, Unember and Design Cuts for making Friday a beautiful day! Thank you so much for taking the time to leave us a comment Diana! We hope that this font makes a great addition to your resource collection :). Muchas gracias por esta preciosa fuente. De nada María, we hope that you love working with it!